What Are the Side Effects of Too Much Citric Acid? Citric acid is found in a variety of fruits and vegetables. High concentrations of it are found in lemons and limes, according to ScienceDaily.com, a medical news site. The natural preservative is often used to add a sour taste to foods and soft drinks. It is used in laxatives and in combination with acetaminophen and sodium bicarbonate as a medicine to relieve heartburn and acid indigestion. Medicine may be taken several times a day or for a few days. However, taking too much citric acid can create a variety of problems. 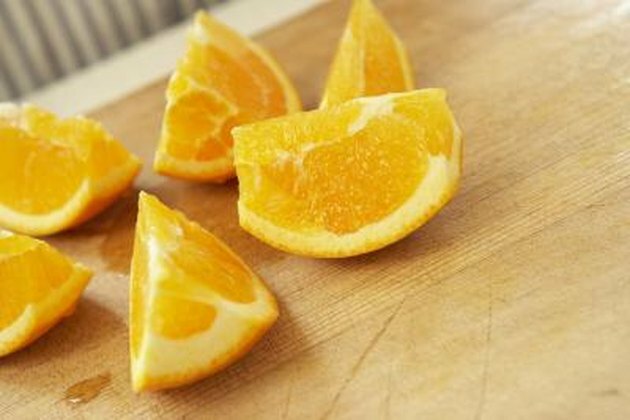 The most common symptoms of citric acid overdose include stomach cramps or pain, diarrhea, nausea or vomiting, loss of appetite, increased sweating and swelling, and pain in the abdominal or stomach area. In rare cases, yellow eyes or skin may occur. Citric acid may be visible in the stool. Contact your doctor immediately if any of these effects occur after taking medication with citric acid. Less common symptoms of too much citric acid are more serious. Symptoms include bloody or black, tarry stool, or bloody or cloudy urine. There may be a frequent urge to urinate or a decrease in the amount of urine. Other symptoms may include fever, headache and an increase in blood pressure. You may experience back or side pain as well as muscle pain. Other symptoms include nervousness or restlessness. Skin rashes, hives or itching may also occur. Sores, ulcers or other blemishes may appear on the lips or in the mouth. You may also get a sore throat. Swelling of the face, fingers, ankles, feet or lower legs are other potential side effects. If you have unusual bleeding or bruising, tiredness or weakness and weight gain, it could indicate citric acid overdose. You may also experience numbness or tingling in the hands or feet. Contact your doctor immediately if you experience any of these symptoms. More serious episodes from side effects may include severe stomach pain, ongoing diarrhea or vomiting. Other severe side effects include coughing up of blood, slow breathing and an uneven heart rate that may be too fast or too slow. In some cases, there may be confusion, anxiety, weakness, irritability and mood changes. Seizures and convulsions are also possible. It is important that you seek medical help if you have any of these symptoms.